Terahertz progress is unstoppable worldwide and Terasense is especially proud to lead the way into this new world of innovating imaging technology offering an alternative way of ‘sensing another vision', as our motto used to say. While our customers are getting ready for their summer holidays Terasense team keeps working hard to meet their growing and versatile needs, this year and 'happily thereafter'. And our efforts yield results! 2018 is turning into a fruitful year for Terasense in terms of new THz related discoveries that quickly passed the 'pipeline' and became real commercially available products. 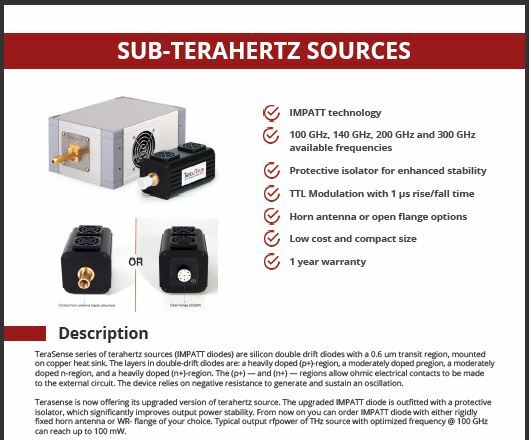 As was previously announced, we have managed to considerably widen our product line for terahertz sources, which now covers frequencies 100GHz; 140GHz, 200GHz; 300GHz. What is remarkable is that for each frequency sources are now available with at least two output power options as outlined below. Of course, higher power models are priced a bit higher, but in terahertz world 'the game is worth the candle'. In fact, the progress with our Terahertz sources has gained such momentum that our marketing department sometimes is legging behind our research and development team that keeps generating new brilliant ideas and yielding new products. This time we are happy to catch up by posting an updated version of our general brochure for all THz sources that is pretty self explanatory. You are welcome to download it from our web-page dedicated to THz sources or simply ask us and we will send it you. We have another updated promo-brochure for our 'revved up' 300 GHz wave source line. 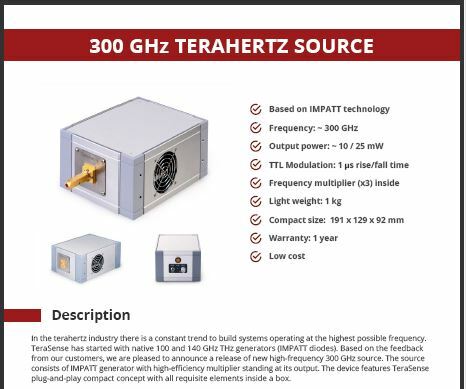 It is imperative to note that the brochure treats the frequency of ‘300 GHz’ a bit broadly, while in reality our 300GHz models can be subdivided into 280 GHz (25mW) and nearly 300 GHz (10mW). Well, as usually, details are essential. Needless to say that our datasheet/promo-brochures provide only key and general information and our customers are welcome to contact Terasense for more details, technical consultation and a friendly piece of advice.